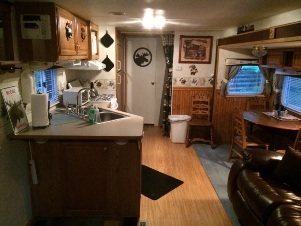 This unit consist of a 30' self-contained camper. 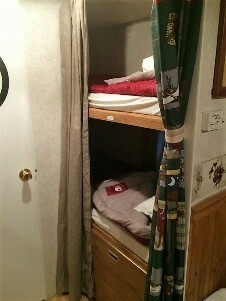 In the camper, there is a bedroom with a queen size bed as well as an area with one set of bunks. Bathroom with a tub/shower combination. The living room has a double recliner, TV and VCR. 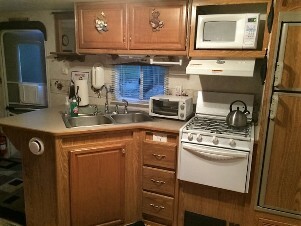 The kitchen has a mid-size refrigerator and 3-burner gas range. 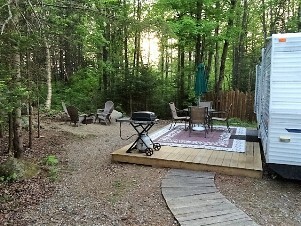 The large deck off the camper is perfect for dining or viewing the fire pit. 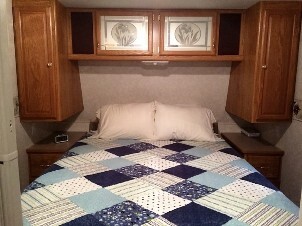 The camper is air conditioned. This unit is open Memorial Day till late fall, weather permitting. *The above rates are for up to 2 guests, kids under 2 years old stay free. 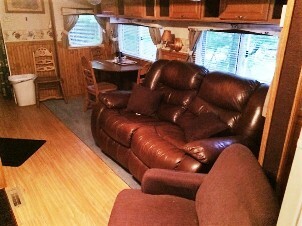 $15/night for each additional guest. Rates do not include NH room tax. page. Or, click here to view availability calendar of all cabins including this one. Click here to view availability calendar for all units.